Weather-resistant and softly cushioned, the sleek design of the Ventura collection gives a modern eloquence to your outdoor spaces. Product Description Holiday Getaway. Entertain in modern flair with the Ventura outdoor living room set. Each piece allows you to bring your modern design outdoors with its distinctive style of splayed legs and clean-lined silhouette. Whether it’s a pleasant conversation in the early morning summer breeze, or a lively patio party, the Ventura outdoor living room set makes it feel like a beachy getaway. Customer assembly required. Unique Features: Contemporary-style splayed legs add stability and elegance. Deep-set, plush cushions invite you to sit back and relax in absolute comfort. The perfect accent piece to complete the collection and provide a well-rounded space for guests. 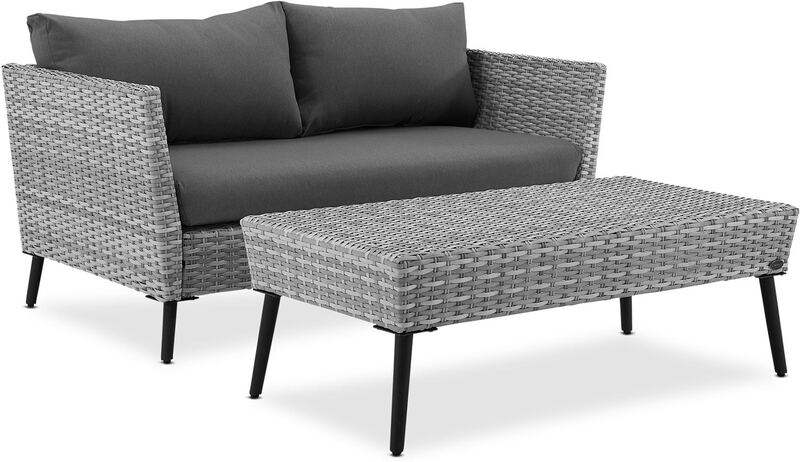 Constructed with all-weather wicker and a durable powder-coated steel frame to withstand all elements. Construction: Constructed of strong metal that will endure inclimate weather conditions. Cushions: Foam cushions are comfortable for patio lounging.